Health • Devotees say probiotic brew can cure what ails you, but making it at home involves safety issues. Paul Fraughton | The Salt Lake Tribune Matt DelPorto holds a bottle of kombucha tea that he added to orange juice. Paul Fraughton | The Salt Lake Tribune Matt DelPorto explains the process of making kombucha tea to Kenna Onwuzuruoha on June 13 Paul Fraughton | The Salt Lake Tribune Matt DelPorto enjoys a cup of kombucha tea. 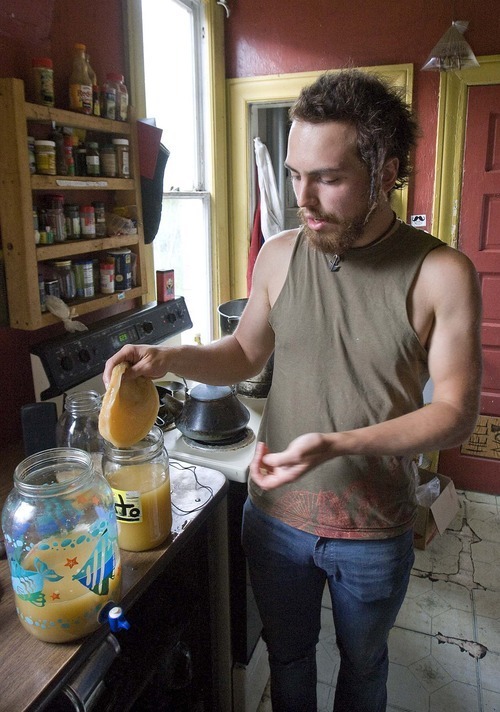 Paul Fraughton | The Salt Lake Tribune Matt DelPorto pulls the kombucha culture from a jar. He will use a piece of the culture i Paul Fraughton | The Salt Lake Tribune Matt DelPorto shows off the consistency of the kombucha culture that he uses in the ferme Paul Fraughton | The Salt Lake Tribune Matt DelPorto pours some tea into a jar containing a piece of the kombucha culture to giv Paul Fraughton | The Salt Lake Tribune Mark Purdy stirs his kombucha culture. 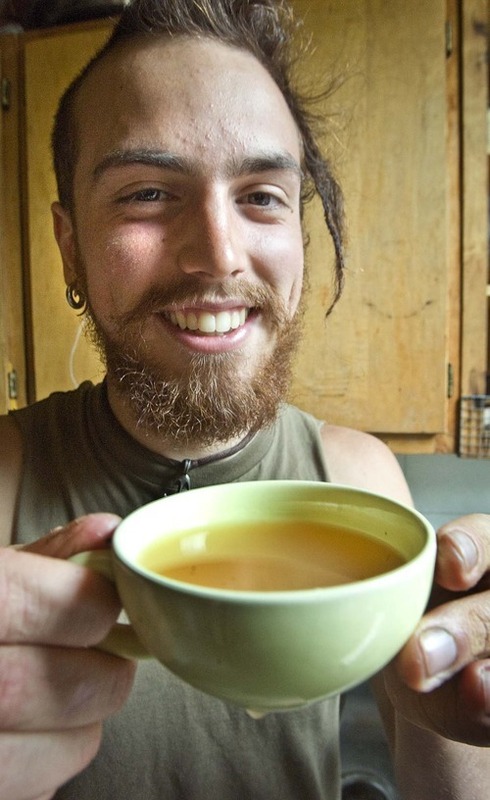 He can grow the culture and make his own kombucha Paul Fraughton | The Salt Lake Tribune As his water boils Matt DelPorto drops in several tea balls and brews regular black tea. Paul Fraughton | The Salt Lake Tribune Matt DelPorto holds a bottle of kombucha tea that he added to orange juice. Paul Fraughton | The Salt Lake Tribune Matt DelPorto explains the process of making kombucha tea to Kenna Onwuzuruoha on June 13. Paul Fraughton | The Salt Lake Tribune Matt DelPorto enjoys a cup of kombucha tea. 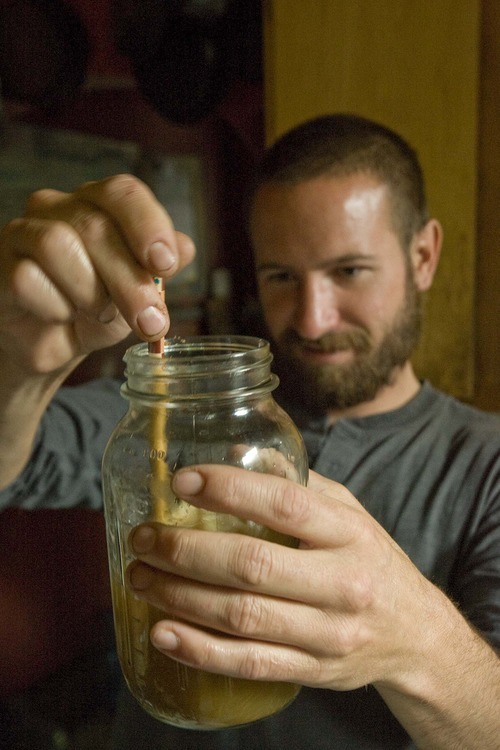 Paul Fraughton | The Salt Lake Tribune Matt DelPorto pulls the kombucha culture from a jar. He will use a piece of the culture in a brewed tea that will then be covered with a cloth and left to ferment. Paul Fraughton | The Salt Lake Tribune Matt DelPorto shows off the consistency of the kombucha culture that he uses in the fermentation process. Paul Fraughton | The Salt Lake Tribune Matt DelPorto pours some tea into a jar containing a piece of the kombucha culture to give to Mark Purdy. Paul Fraughton | The Salt Lake Tribune Mark Purdy stirs his kombucha culture. He can grow the culture and make his own kombucha from the starter. Paul Fraughton | The Salt Lake Tribune As his water boils Matt DelPorto drops in several tea balls and brews regular black tea. 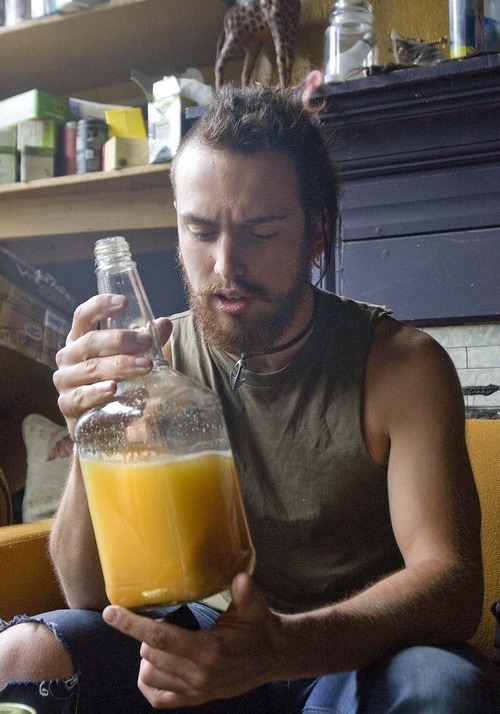 After the tea cools he adds sugar and the kombucha culture to the mix and lets it ferment. We are standing in a kitchen, staring at something floating in a jar. It looks sort of like congealed animal fat and sort of like pond scum. Matt DelPorto likes what he sees. "Learn how to make your own tasty, probiotic kombucha," the blurb for the class had said, so a few of us showed up on a Monday evening at Boing! House, "an anarchist collective" in Salt Lake City. 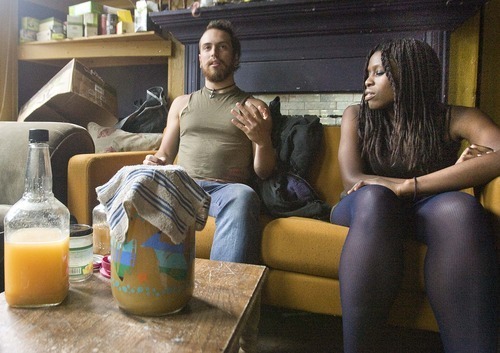 DelPorto, the instructor, had brought along a jar of already brewed kombucha tea, with the blob floating on top. This is called a SCOBY, "symbiotic culture of bacteria and yeast." So, yes, it's a bacterial-fungus thing, and the tea it ferments into after about a week tastes on a good day like a cross between balsamic and Martinelli's sparkling cider. According to devotees, it can help cure what ails you. DelPorto was in grade school during the last kombucha wave in the mid-1990s. The tea seems to rise and fall in popularity as new people hear testimonials about it. This time around, the Internet and commercial versions of the drink have made the phenomenon more widespread and nearly mainstream. These days, you can order kombucha on Amazon.com. At Google headquarters, the chef serves home-brewed kombucha in the company's employee cafeterias, on the same menu with, say, Opah en Papillote. According to Hannah Crum, who runs the website kombuchakamp.com, market researcher Mintel estimates commercial kombucha sales at $123 million in 2010. Or you can brew your own batch, either getting a free SCOBY from another kombucha fan  the "mother" blob makes "daughters," so in terms of availability, kombucha starters are sort of like neighborhood zucchini. Or you can buy a starter online. A 16-ounce bottle of commercial kombucha tea (sometimes flavored with fruit) costs about $3, which is why there's so much DIY kombucha. All you need is black or green tea, sugar and the SCOBY. Keep it sterile •The trick is to make sure the bottle is sterile, and your hands, cooking equipment and surfaces are clean. The high acidity of the fermented concoction kills most contaminants, but mold can sometimes be a problem. Fermenting the tea in ceramic bowls can cause lead poisoning. Cautions about the tea generally cite the death and near-death of two women in Iowa in 1995; both women were kombucha drinkers, but the U.S. Centers for Disease Control concluded only a "possible association" of their illness (complications from metabolic acidosis) with the tea. A CDC bulletin issued at the time also noted that "no known human pathogens or toxin-producing organisms were identified" in a microbiologic analysis of the tea. There have been no CDC kombucha warnings since then. The CDC vaguely concluded: "Drinking this tea in quantities typically consumed (approximately 4 ounces daily) may not cause adverse effects in healthy persons; however, the potential health risks are unknown for those with pre-existing health problems or those who drunk excessive quantities of the tea." You'll find plenty of testimonials about the brew on various websites. According to kombuchaamerica.com, for example, the maladies that are helped include Type I diabetes, gray hair, insomnia, arthritis, acne, cancer, impotence, acid reflux, MS and PMS. Cultured experience •Salt Lake architect Alyssa Kay started drinking and then making kombucha three years ago. "The first thing I noticed was that my hair and fingernails were healthier," she says. "After a while I noticed I wouldn't get all the little bugs going around." Like active-culture yogurt, kefir, and miso, kombucha is considered a probiotic  that is, it contains live micro-organisms similar to the "friendly" flora found naturally in the human gut. These, according to the National Center for Complementary and Alternative Medicine of the National Institutes of Health (NIH), are believed to protect against the not-so-friendly microorganisms that can make you sick. They're also believed to aid in digestion and absorption of nutrients. The tea is said to date back to at least the 220 B.C. Tsin Dynasty in China, where "it was prized for its detoxifying, energizing properties," according to the journal Food Research International. Six hundred years later it was reportedly introduced to Japan  to help the emperor's digestive problems  and later it made its way to Russia, then Europe and finally the U.S. Most of the early research on kombucha was done in Russia, and currently much of the research is being done in countries such as Egypt, Turkey and India  where the tea has been found, for example, to result in "recovery of all the pathological changes" associated with rats exposed to radiation. One of the few American studies cited came out of Cornell University, whose the Department of Food Science found that the tea could kill the most common pathogens found in food  including salmonella and at least one pathogenic strain of E. coli. The scientists concluded that kombucha "may be a healthful beverage in view of its anti-microbial activity." Last summer, the federal Tobacco, Tax and Trade Bureau (TTB) alerted grocers that it was looking into the alcoholic content of commercially bottled kombucha, and some retailers voluntarily took the product off their shelves. The product was soon back, but the fate of kombucha isn't certain. Even when the brews are bottled at less than 0.5 percent alcohol, they sometimes keep fermenting on the shelves. According to the TTB website, the agency is still looking into the matter. To make the tea, bring water to a boil. Add tea bags and boil for 5 minutes. Remove from heat and stir in sugar until dissolved. Let the tea cool and remove tea bags. Meanwhile, sterilize all your equipment. Place the glass jar in boiling water and boil for 10 minutes. Place other utensils in boiling water for 5 minutes. Wash your hands well with soap and water before handling the SCOBY. Sterilization is extremely important to prevent cross contamination. Add the sweetened tea. Leave a couple inches at the top of the jar so the SCOBY can grow. Cover the bottle with a breathable cloth. Secure with a rubber band. Keep in a warm, clean, dark location (near the stove or fridge works well). This first fermentation should last about 1 week (a day or two less in the hot summer; a day or two more in the winter). Taste a spoonful each day to decide when it's done. When it tastes the way you like, store in the refrigerator and drink some every day. The brown strings that appear on your SCOBY are not mold, they are dead yeast. Warning • In the rare case that your SCOBY develops mold or gets an insect infection, throw out everything, including the SCOBY and the tea. If you want kombucha that has some "fizz," do a second fermentation. Transfer the finished kombucha to smaller glass bottles that can seal. Make sure they are sterilized! Try it this way the first few times until you get used to brewing. On later batches, add fruit juice or more sugar to give it flavor and fizz. Be careful when adding extra sugar as the bottle can explode. Store in a clean environment. *Get a free SCOBY from another kombucha fan; or buy a starter online.